Spinal care technology developed for astronauts is now available for better chiropractic care here on Earth. The Insight Subluxation Station is a neurospinal screening and evaluation system that uses surface electromyography (SEMG) technology originally designed to measure changes in the spinal muscles of astronauts. At Discovery Back & Body Center, we use the Insight to help identify subluxations, or misalignments of the spine, by measuring muscle activity. Subluxations disturb the muscles regular nerve function, causing an abnormal amount of electrical flow to the muscle as well as other health challenges. 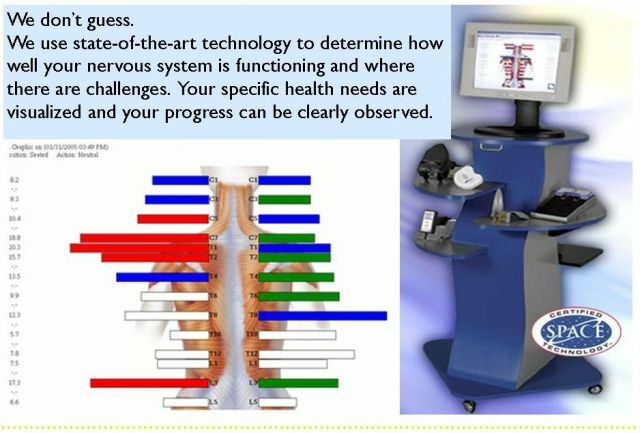 The Insight Subluxation Station measures the electrical flow and charts it using graphics that show the spine and specify precisely how patients should be adjusted. The Insight allows for increased accuracy in diagnosis and improved treatment. The 5-Tech system measures skin temperature differentials and the sensitivity of paraspinal tissues and assesses range-of-motion, and heart rate variability to create visual images that can be used to diagnose patients and help bring better health to as many individuals as possible.